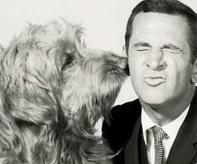 Fang Lethargic, mangy dog on the spy spoof GET SMART/NBC/CBS/1965-70. Fang worked for the spy organization CONTROL. His code names was K-13; his under cover name was Morris. Fang frequently helped bumbling secret agent, Maxwell Smart (Don Adams). When Fang retired, the Chief of Control (Ed Platt) assigned him to burying evidence. The dog who played Fang was eventually written out of the show because of his inability to take commands. Consequently, the dog’s undisciplined behavior caused the director to do multiple takes and run up the cost of each production. Fang appeared with Don Adams and Barbara Feldon on the front cover of TV Guide (August 27, 1966). “Red” the dog who played the role of Fang was owned by Rudd and Frank Weatherwax (of The Studio Dog Training School) but trained by their brother Bill Weatherwax. 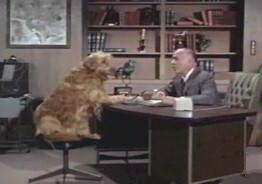 Red also played the role of Jasper in the TV series BACHELOR FATHER replacing the older dog, Tramp, who first played the role of Jasper. Red’s breed has been reported to be part briard as well as a Labradoodle (a cross between a Labrador and a poodle). TRIVIA NOTE: Fang was also the name of the basset hound of police detective Lt. Columbo on the NBC police drama COLUMBO/NBC/ABC/1971-91.